My problem arises during my summer cruising months when the dink resides on the swimstep. It lies with the stbd pontoon resting on the step and the port pontoon pulled near vertical toward the aft rail. All was well for a couple of years until two of the canvas straps that hold the D-rings in place on top of the port pontoon ripped out. I needed a better way to hoist and secure the dink on the aft rail without stressing the inflatable's components. I found this heavy duty cargo net for $60 on eBay. It's 6 ft x 6 ft with 3 ft loop strap extensions on all 4 corners. Since my boat is a 12.5 ft beam, I figured it was just about right. It came the other day and I was impressed with the weight and strength of the product. It weighs about 10 lbs and comes in a very stout storage bag. At the boat, I have two attach points located just above the swimstep and about 6 inches inboard from the outer edges of the transom. These made perfect attach points for the carabiners on the lower corner loops. To load the dink into the net, I attached 20 ft lines to the upper corners and laid the net on the swimstep. With the dingy secured loosely along the transom (stbd to), I let the net fall into the water while holding the corner line. I eased the line around the bow and pulled the net up along the port pontoon. I did the same at the dink's transom and pulled the slack out of the net. Once I was done on the swimstep, I lifted the stbd tube onto the swimstep and entered the cockpit. Once in the cockpit, it was an easy task to tighten the net until the dink rode level with the water and swimstep. The 3 ft loop extensions in the corners aligned perfectly with a couple of my stainless posts between my caprail and my handrail. After I took these pics, I added two more lines to the middle of the upper net to even the pull across the length of the net and dink. 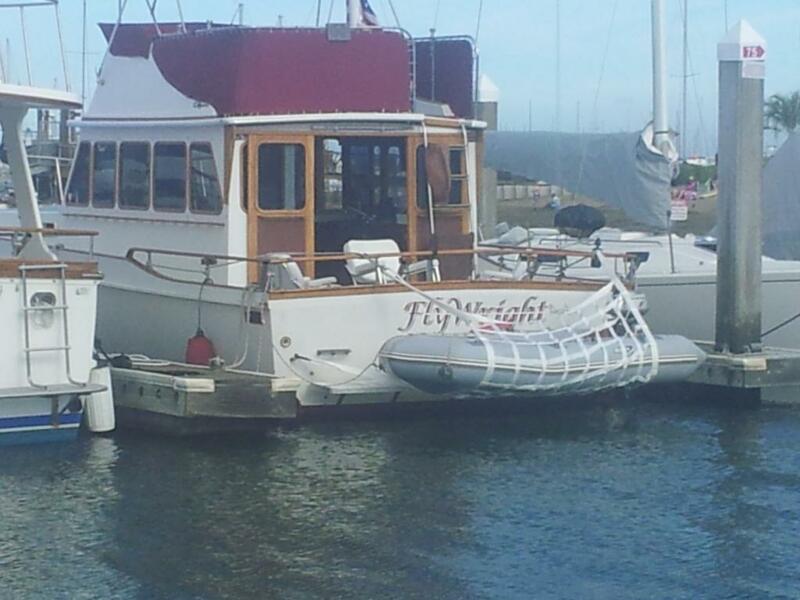 It rode fine for the 30 minute trip from Sausalito, CA to Angel Island where it was launched with great ease. For the 2+ hr ride back to our home marina, I removed the Honda and secured the net without lines over the aft rails. I shifted the dink slightly to stbd allowing better access to the gate at the port corner of my aft rail. It rode perfectly in that position. In a refinement of the cockpit attachments, I purchased 4 more carabiners to simplify the 4 attach points on the upper edge of the net. These should fit on the vertical post on the stbd corner and to the post aligned with the port side loop end in the pics...outboard of the rod holder above the "F" in FlyWright. In general, dinghies riding on transoms are not the most attractive part of the boat. I especially dislike blocking the transom name while enroute. 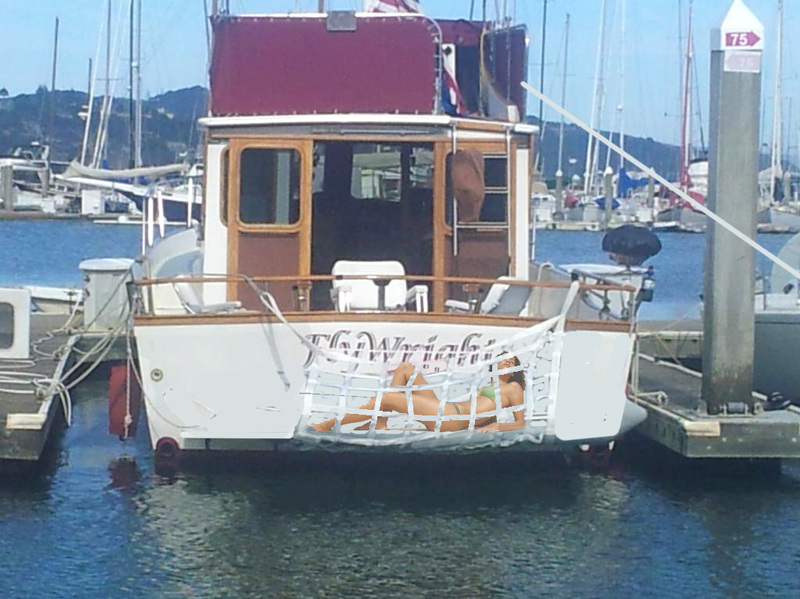 While this net does nothing to improve the look of a dink on the transom, it does allow a filtered view of the boat's name. So for the cost of a $60 net and $30 in carabiners, we've got a functional davit alternative for use next week for our week-long Delta adventure! I've had the same issues, and as a temporary measure been using my fender board tied off off my swim step, as well as a tangle of rope to give additional support to the dinghy. It sort of works but your idea is so much better. It solves the problem of stress on the dinghy components, as well as security for the dinghy in all sea conditions, and is within my budget . Bravo! I like it! 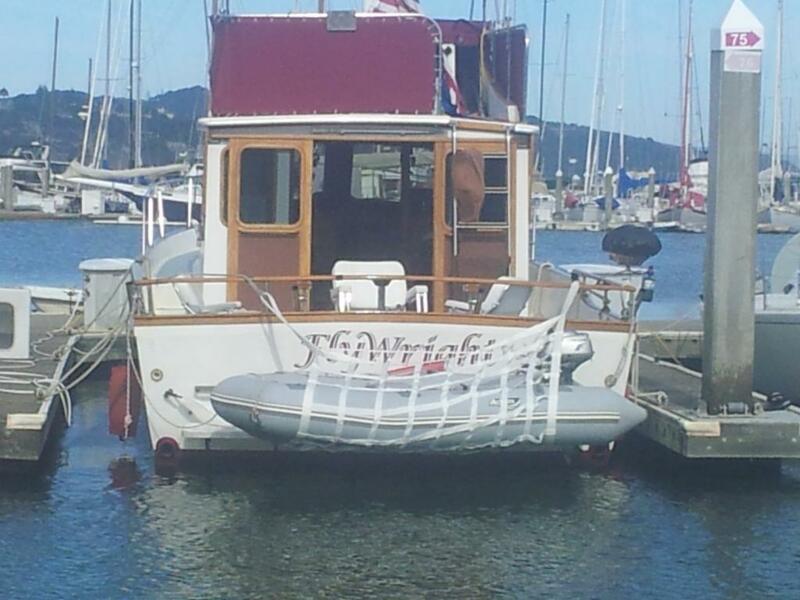 Looks like a good alternative for an inflatable and it might work for a RIB or lightweight "glass boat. Nice alternative. Also in evidence is the usefulness of the cargo net for general securing of the dinghy or bulky items anywhere, even on deck in ocean conditions. Where did you get the net? Thanks for sharing, Al. I like it FlyWright ,good idea . The boat is looking good also .Good pictures . Al that's a great "organized solution to a problem". heavy duty cargo net for $60 on eBay. Where did you get the net? Thanks guys. It's hard to dog paddle with one arm and keep the cellphone dry while taking boat pics like this...but it's worth it. What? You can't walk on water? Of course not. If I could, I wouldn't need a boat. Oh, you'd still have a boat, because you'd get tired of walking all day. You have to hand it to Al. This earlier pic demonstrates that before he'll put the dinghy at risk, there's lots of research and development. LOL!! My transom has never looked better! That looks great, Larry! I gotta save that one. That whole counter is full of good stuff....from the rum, to the Coppola (one of Meg's favorites I didn't list) and the Ken's Chunky Bleu Cheese dressing (my favorite!). I think you might have combined my Old Vine Zin and Apothic Red recommendations and got Old Vine Red. Is that the Marietta? Never tried it, but glad she likes it. I'll have to give it a try. A mermaid? Looks like all that fishing finally paid off. The net seems a good system. I`ll need something if I move to a Marina. 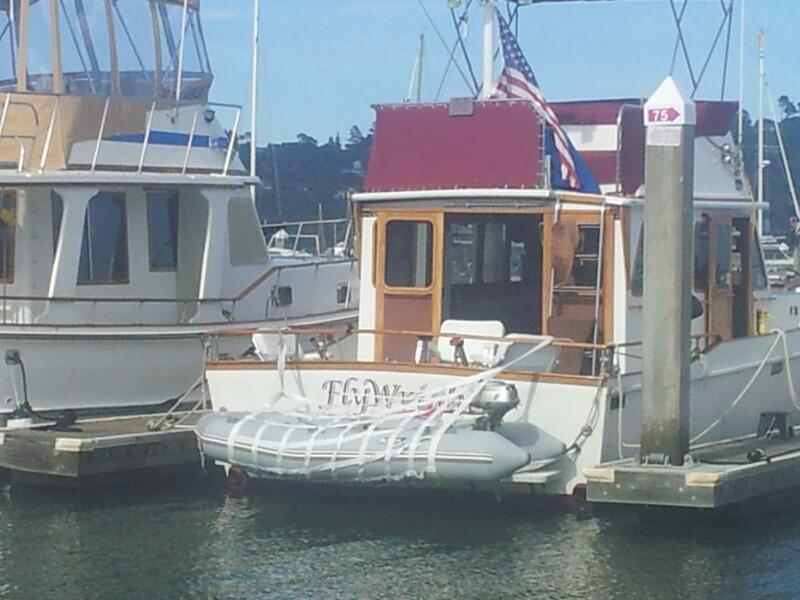 Davits or dinghy crane? Plenty of unused extended FB space available.